The St. Rita Mustang track team claimed their second sectional championship by winning their own sectional in convincing fashion on Thursday afternoon. The Mustangs were lead by state qualifiers Theo Phipps in the long jump and hurdles. The senior set personal bests in both events to advance to this weekend’s state meet in Charleston, IL at Eastern Illinois University. Other individual state qualifiers for St. Rita include: Senior Anthony Driver in the Triple Jump, sophomore Mick Doyle in the Long Hurdles, and sophomore Marcus Coleman in the 200M dash. Three Mustang relay teams also advanced to next week’s meet in Charleston: the 4X100 consisting of Phipps, Coleman, senior Rashaad Williams, and freshman Tahron Hayes; the 4X200 consisting of Coleman, Williams, Doyle, and freshman Christian Law; and the 4X400 consisting of Coleman, Doyle, senior Nick Martone, and sophomore Andrew Lenehan. The Mustangs will depart for Eastern Illinois later in the week lead by Head Coach Pierre Nealon and assistants Mark Bonds ’11 and Chris Coates-Nightengale. The Catholic League Blue is widely regarded as the best baseball conference in the state of Illinois and according to some maybe the entire country. On Senior Day Saturday at St. Rita, Kansas recruit and Mustang Ace Steve Washilewski took the hill for his fourth start against a CCL Blue opponent this season, and just like the previous three, it ended in a St. Rita victory. The Mustangs prevailed over the Vikings 10-5 on a warm spring day at 77th and Western as Washilewski (8-1) allowed two runs in his 5 2/3 innings of work to pick up the victory. In his four starts against the Blue (Providence, Brother Rice, Mt. Carmel, and St. Laurence) Washilewski has allowed only four earned runs in 25 innings of work (1.12 ERA) striking out 26 while walking only four. The Mustang offense exploded in the bottom of the first on Saturday for four runs keyed by a bases-loaded double by senior Tyler Woynerowski to stake St. Rita to lead they would never relinquish. Senior Justin Ruthrauff was the hitting star on the day going 3-3 with a walk. After a gritty at-bat in the first that lead to a bases on balls, Ruthrauff doubled and tripled in consecutive plate appearances before delivering the big blow, a 2-run single to right, against a drawn-in infield to give the Mustangs some insurance runs late in the game. Senior designated hitter Blake Soria added a solo homer to left center for the last run of the day for St. Rita. The Mustangs (23-7, 15-5) look to complete the sweep of the Vikings for the second consecutive year on Monday, May 15 as they travel to Burbank for a 4:30 p.m. first pitch. The St. Rita High School volleyball program recognized four seniors on Wednesday, May 10 at their final regular season home match vs. St. Francis of Wheaton. Those seniors are: Sean Coghlan (St. Cajetan), T. J. DeCesare (St. John of the Cross), Liam Kelly (St. Cajetan) and Brendan Murney (St. Alexander). Despite a tough loss to St. Francis, St. Rita is looking forward to future challenges. While the freshman team recently captured a share of the Catholic League title, the varsity team is preparing for upcoming playoffs. Head coach Brian Hagen '04 said. "It's been a great experience to coach these young men. Our seniors have accomplished a lot during their time; but their work isn't done yet. I expect them to continue to provide senior leadership for our team as we head into the regional semi-finals at Gwendolyn Brooks Prep on May 23." Mike Zunica thought he was done getting emotional. St. Rita honored its baseball coach during a pregame ceremony Saturday by retiring his No. 13 and naming the field after him, beginning with the 2018 season. "It got the best of me," Zunica said. "I didn't think I would get emotional but I did. Once the game started, I thought I was good." Junior catcher Jake Zylman then cracked a grand slam in the first inning of the Mustangs' 12-5 Catholic League Blue victory over Loyola. A day apart, St. Rita High School graduates Pat O’Connor and Kenny Golladay picked up the phone and heard the words they had both dreamed about for years. Bob Quinn, general manager of the Detroit Lions, was on the other end, informing the duo they had been drafted as part of the NFL Draft on April 27-29. On Sunday afternoon, May 7, 2017, at Beverly Country Club, the entire St. Rita Basketball Program came together to celebrate their success this season at their annual awards banquet. The keynote speaker was former Duke University guard and current Head Basketball Coach at Marquette University Steve “Wojo” Wojciechowski. Coach “Wojo” emphasized to the St. Rita basketball players in attendance to use basketball as a vehicle to college. He was a McDonald’s All-American high school player who earned a scholarship to play for Coach Mike Krzyzewski at Duke. “Wojo” then joined the Duke staff where he spent 15 years as an assistant before taking over the Marquette program 3 seasons ago. Former St. Rita Head Basketball Coach John Bonk ’75 was also in attendance to help induct two of his former players, Rashay Russell ’03 and Michael Rembert ’03, into the St. Rita Basketball Hall of Fame. Coach Bonk spoke of the high character of both inductees and the impact that each of them had on him and the entire St. Rita Basketball Program as they led the 2003 team to St. Rita’s first Catholic League Basketball Championship since 1970. Freshman Dalen Horace, sophomore Myles Montague, and senior Paul Kingsley each spoke on their teams’ seasons thanking their teammates and coaches for a great experience. Head Coach Gary DeCesare then announced the award winners for this season. On Saturday, May 6, 2017, the St. Rita community came out in full force to honor retiring head baseball coach Mike Zunica. In a moving, hour-long, pre-game ceremony Zunica was honored for his 21 years of service to St. Rita of Cascia High School as Head Baseball Coach. Zunica, who is retiring at the conclusion of the 2017 season to allow him to follow his son’s baseball career at Kansas University, will remain at St. Rita as President. During the ceremony, which was attended by hundreds of family, friends, former players, and former teammates and coaches, it was announced by St. Rita Chairman of the Board of Directors Ernie Mrozek that the St. Rita Baseball Field beginning with the 2018 season would forever be known as Mike Zunica Field. Zunica’s #13 was also retired and a special gift was presented to him by his coaching staff, a state-of-the-art hand-made rocking chair made of baseball bats commemorating his years of service. Zunica then gave an emotional 25-minute speech thanking his parents, family, friends, and coaching staff before finishing with a touching tribute to the St. Rita Community, thanking them for accepting an “outsider” as he referred to himself and embracing him as a Rita guy. As for the game, junior catcher Jake Zylman provided some early offense by cracking his fourth homer in the last five games, a grand slam down the right field line in the bottom of the first to give the Mustangs an early 4-0 lead. After Loyola scored two in the third and three in the fourth to tie the score at five, senior centerfielder Charlie Rodriguez cracked a two-run shot to right to give the Mustangs the lead for good. Senior Steve Washilewski then put the icing on the proverbial celebratory cake by cracking a three-run homer to deep left in the bottom of the sixth to provide the 12-5 winning margin. Sophomore Logan Strutz was great in relief picking up the win while throwing 2 2/3 scoreless innings. The Catholic League Blue win capped off a very special day for the entire baseball program and particularly Mike Zunica and his family. It was a fitting tribute for the all-time wins leader in St. Rita Baseball history. It was a day neither Zunica nor his family will ever forget! St. Rita senior goalie Trevor Scianna is planning on attending Villanova University in the fall. He’s the valedictorian of St. Rita’s Class of 2017, so admission to the prestigious Augustinian university wasn’t a problem. The cost, when you consider the travel and other expenses, though, may have been; but not anymore. 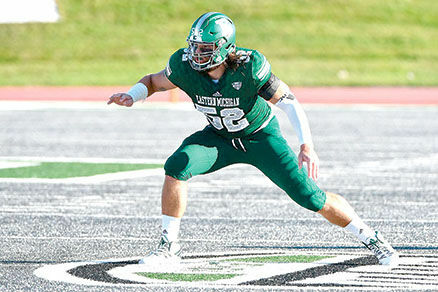 Scianna recently received one of three Chicago Blackhawk Alumni Scholarships, which is worth $30,000 over his four years of college. Any senior hockey player, who plays for his high school team, is eligible to apply for the scholarship. It is then rewarded to three current senior hockey players in the state of Illinois based upon the student’s dedication to his school, community, and the sport of hockey. Applicants were required to submit two essays about themselves, and they were required to supply three letters of recommendation from their respective schools. Scianna’s dedication to his studies while playing two varsity sports, acting as Drumline Captain for the St. Rita Band, and taking part in several service projects, including Habitat for Humanity and the Special Olympics, made him a more-than-deserving choice for this prestigious honor. 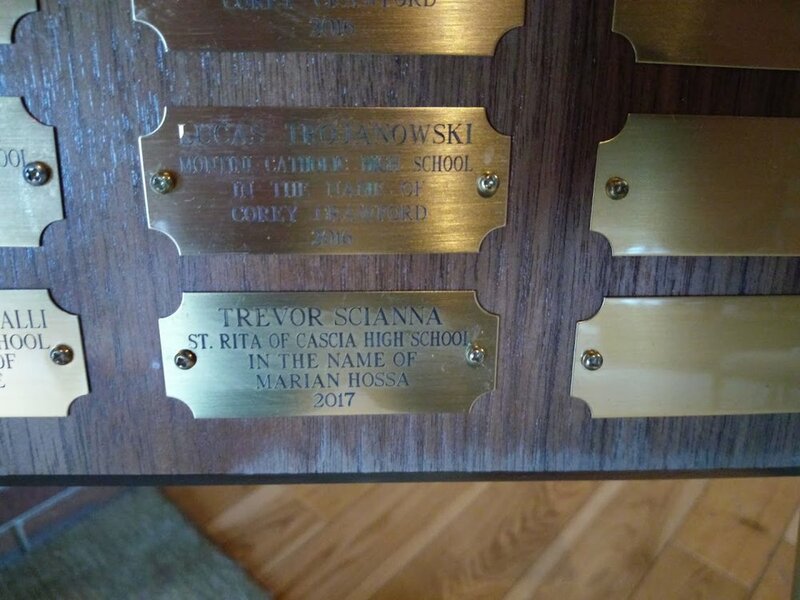 Scianna becomes the second St. Rita Mustang hockey player to win the prestigious award following in the footsteps of 1992 St. Rita grad and all-state goalie Mike Kelly, who coincidentally attended Villanova University as well. 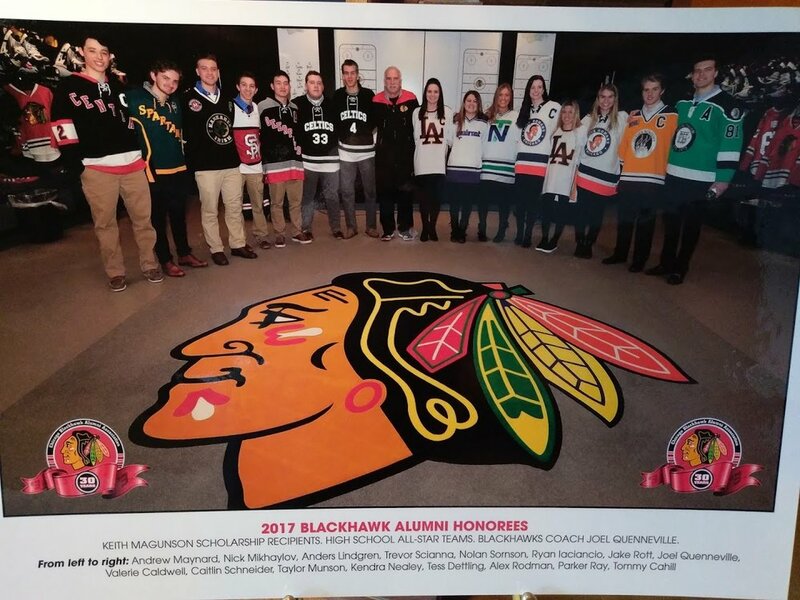 All honorees are honorary members of the Blackhawk Alumni Club.